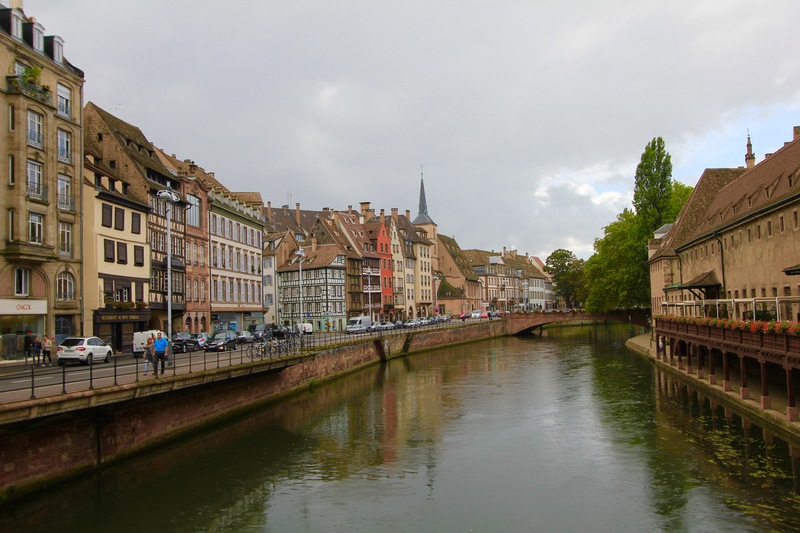 Visiting the French city of Strasbourg, you experience what it is like to be an area that has seen tremendous conflict between various cultures over 2,000 years and the impacts seen today. 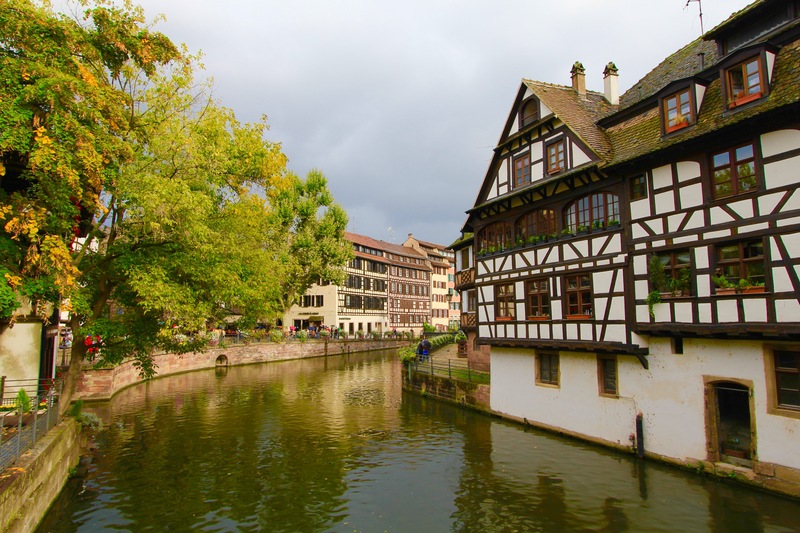 From the German architecture of its buildings in the historic city center to the French language and food found throughout the city, Strasbourg is full of rich history that today embraces both its historic charm and its modern sensibility. This contrast between historic and modern is no more evident than cruising around the canals, passing 700 year-old half timber houses and then the next moment, passing the ultra-modern architecture of the European Union Parliment Building. 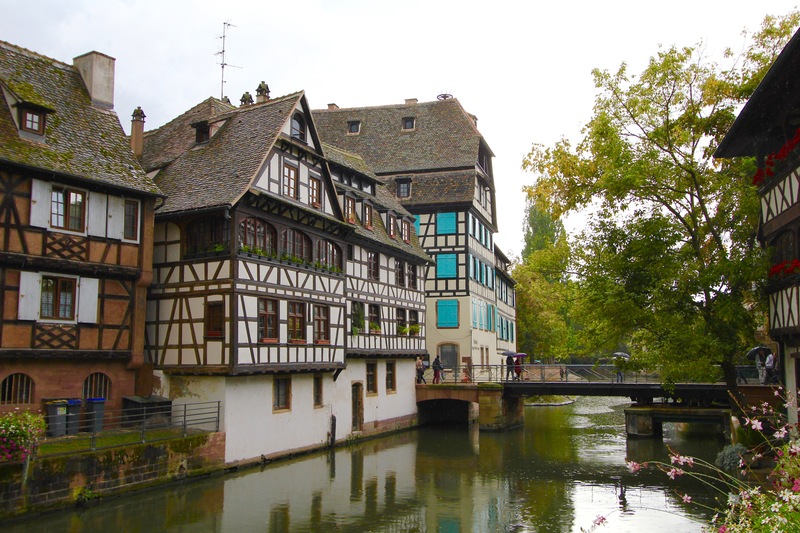 The city of Strasbourg is the capital of the French Region of Alsace, which for us Americans a “Region” is like a US State. Some Regions of France are more familiar — Champagne, Bourgogne, for example. 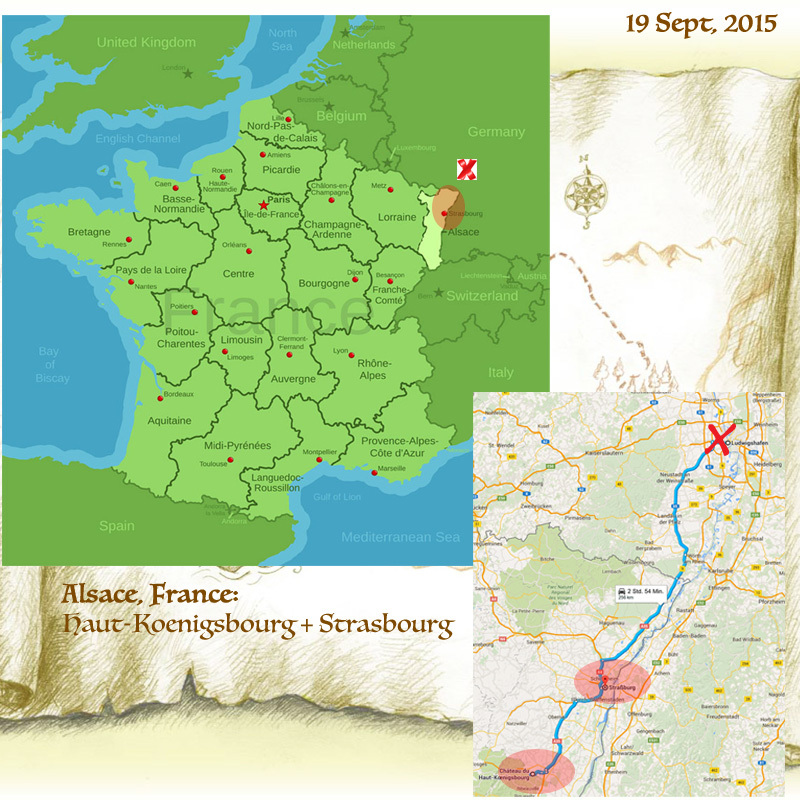 But, one would be hard press to find a Region in France with a more colorful history than the Alsace Region! 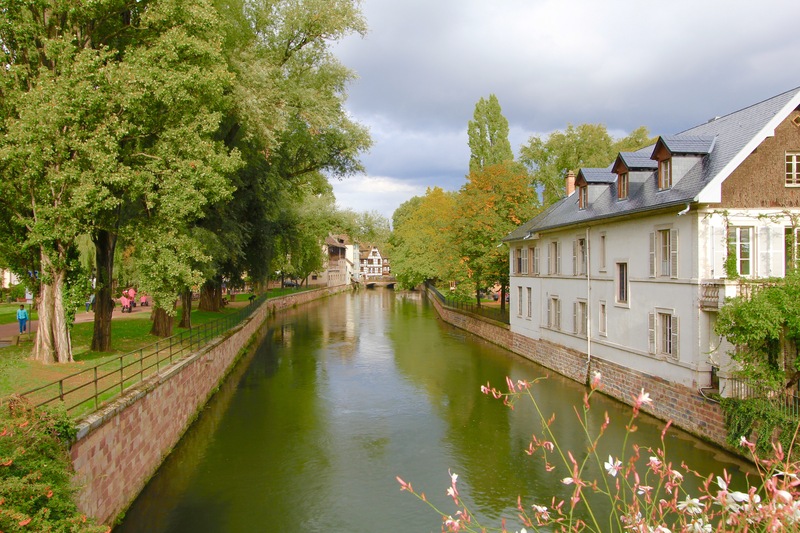 In a country about the size of Texas, the Alsace Region is just a little larger than the US State of Delaware (Alsace is about 8200 square kilometers vs. 6500 square kilometers for Delaware). Traveling through the Region, you pass mainly gently rolling hills of farmland that has on its eastern border the Rhine River and Germany, and on its western border the Vosges Mountains. 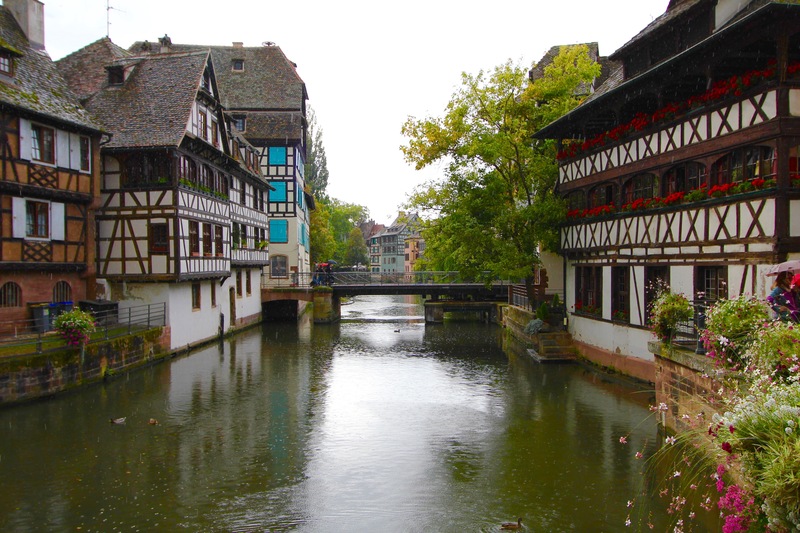 With this location between the Rhine River and the Mountains, the Alsace has changed ownership between France and Germany many, many times over the centuries due to designating where the border lies between both countries. 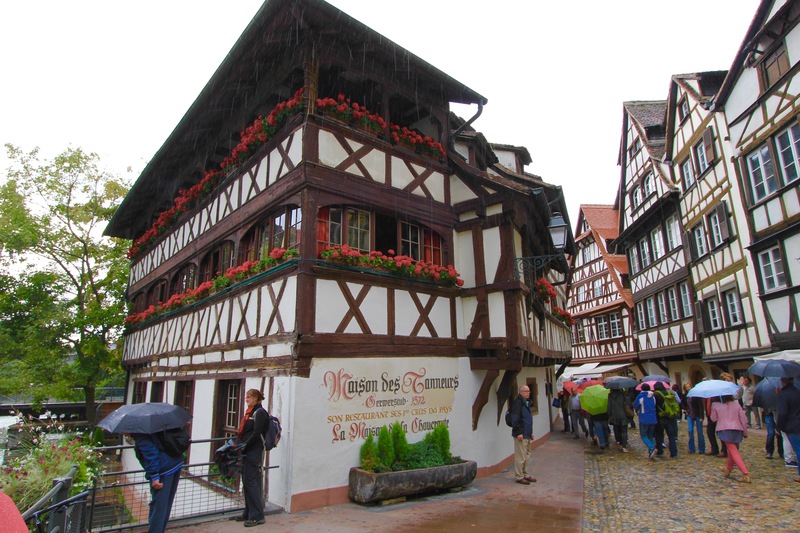 We visited the city of Strasbourg in the afternoon after leaving the mountain-top castle of Haut-Koenigsbourg. Information about this beautiful medieval castle can be found here at this previous blog post. 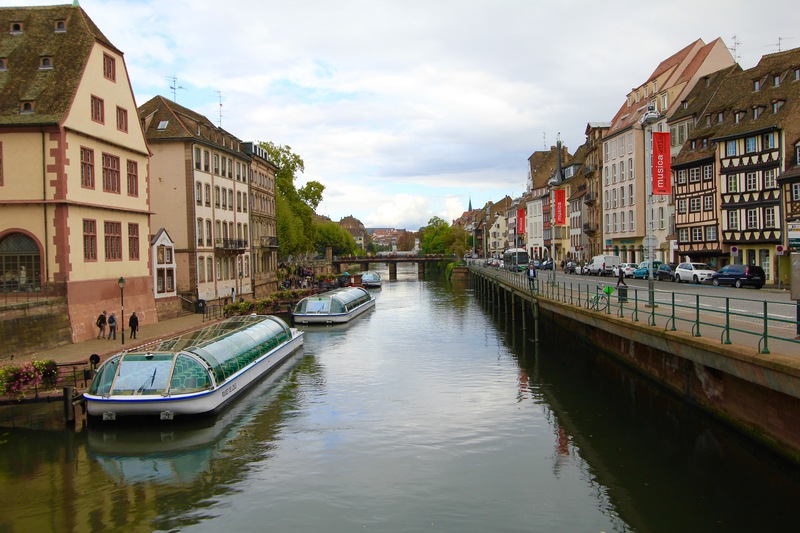 The current population of Strasbourg is about 450k people, making it the 9th largest city in France. After leaving the castle, we drove 30 minutes northeastward to Strasbourg. Strasbourg is a modern city, but its old, center part is absolutely stunning with postcard views around every corner and across every bridge! This historic center is called Grande Ile (Grand Island) because a river flows to the city and canals have been diverted to form the island from which the city originated. The entire city center lies on this island, and has been listed as a World Hertiage Site by UNESCO. Here’s the history of Strasbourg summed up in one paragraph! The first inhabitants of the area were the Celts around 1300BC, followed by the Romans around 12 BC, then followed by different German Tribes, Huns, Franks, Rome again (923-1262), the Germans again (1262-1332). In 1332, the town’s citizens rebelled and they formed an independant free republic, then in 1348, half of the population died from the plague. This resulted in 1349 the Jewish people being blamed and 1,000 Jews were burned to death. Then, the Germans took over during the Protestant Reformation, then the French again during the Thirty Years’ War, then the Germans again, then Napoleon claimed the city again for France, then the Germans again until the Treaty of Versailles at the end of WWI when it went back to France, then the Germans again during WWII, and then finally back to France in 1944. Now THAT is some history!! The result is today a beautiful mix of French and German culture. 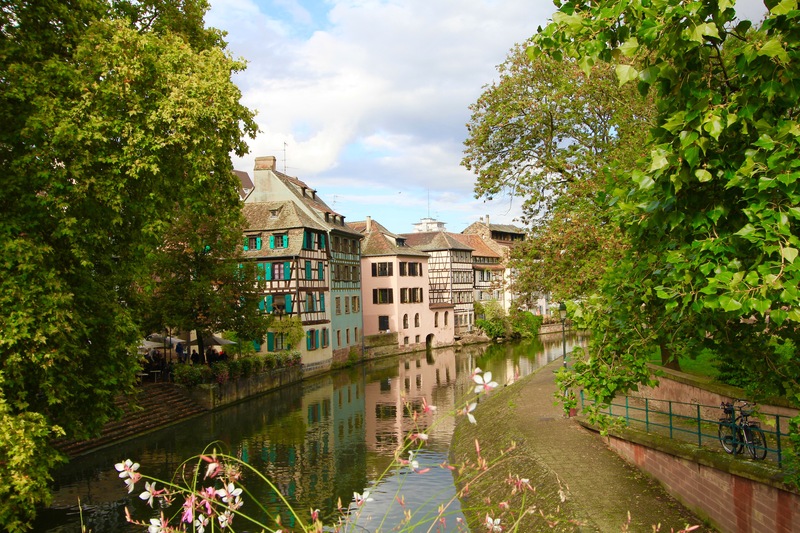 Strasbourg is a large city, but for us, the main attraction is the city center and the Grand Island. An icon for the city can be found almost exactly on the center of the island, and this is the Cathedral Notre Dame of Strasbourg. Construction started in 1015 and ended 1439. 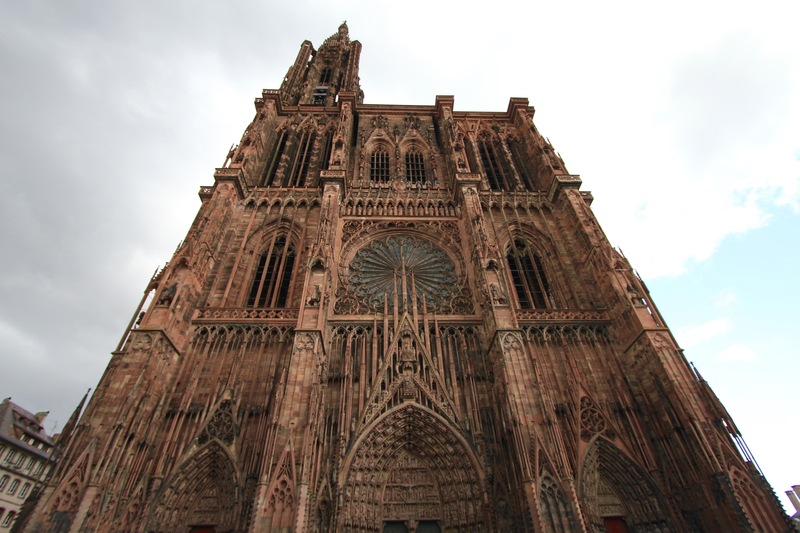 The spire is 142m (466′) tall making it today the 6th tallest church in the world — the tallest in France. 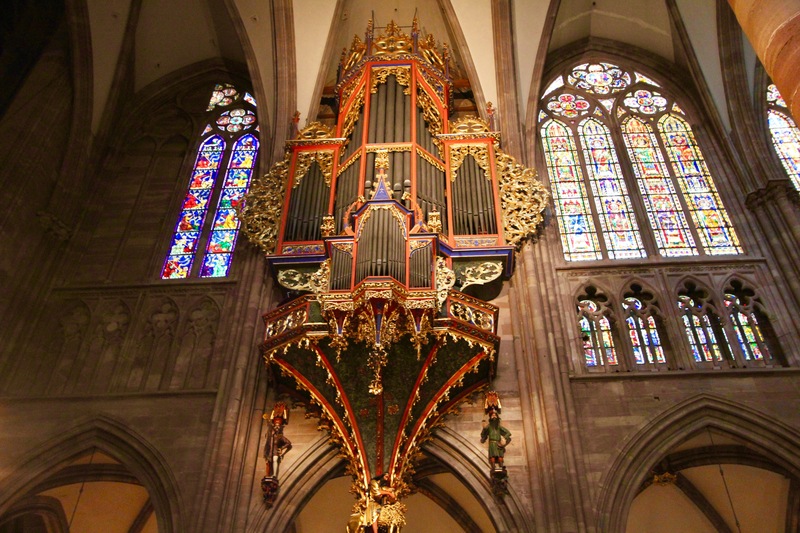 During the Protestant Reformation, the cathedral became Lutheran and saw sermons by Martin Luther and John Calvin. During the French Revolution, King Louis XIV of France returned the cathedral to the Catholics, where today it remains a catholic cathedral still in use. 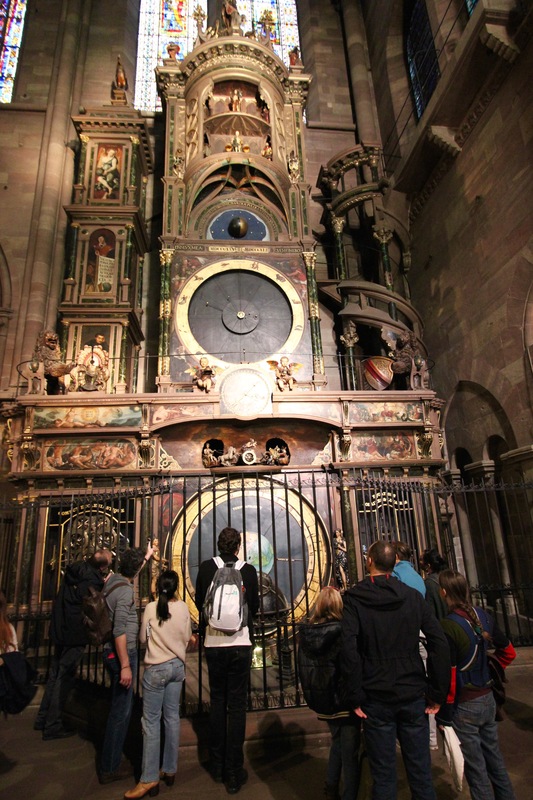 In 1352, an astronomical clock was constructed inside of the Cathedral that calculates the time of day, the year, the leap years, calculates Easter based on the first Sunday following the full moon that follows March 21st (the start of Spring). 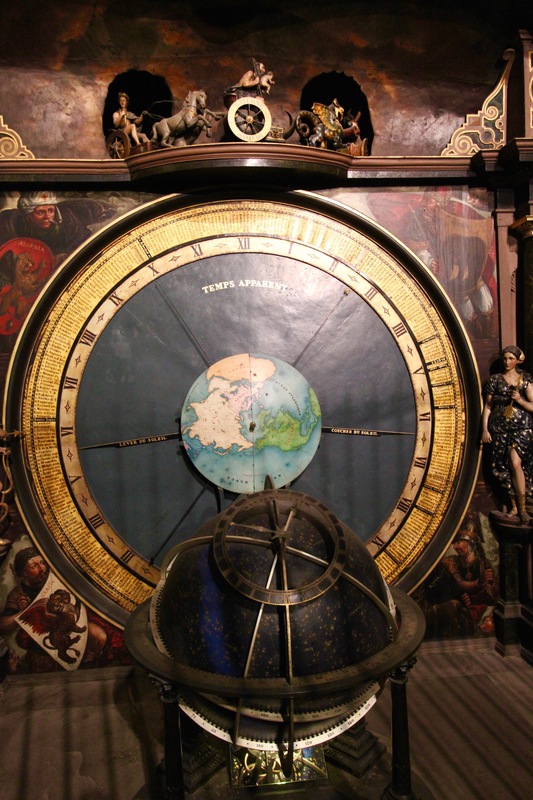 The astronomical clock even shows the real alignment of the sun, Earth, and moon as well as the various solar and lunar eclipses. Keep in mind that this clock was built almost 700 years ago and did these calculations…this is way, way before computers!! A special time to view this clock is at 12:30pm when the clock chimes and 18 inch tall figurines of Christ and the 12 Apostles turn around one after the other. Why 12:30pm? The clock’s creator did not want the chiming of this clock to compete with the large bells of the church when they rang at 12pm. In order to see the clock at this time, you must be inside the cathedral by 11:30am. To try to maintain crowd control, the cathedral closes its doors from 11:30am to about 12:45pm. In most large European cathedrals, typically you find reproduction stained glass windows, as most were damaged from the many wars during history. 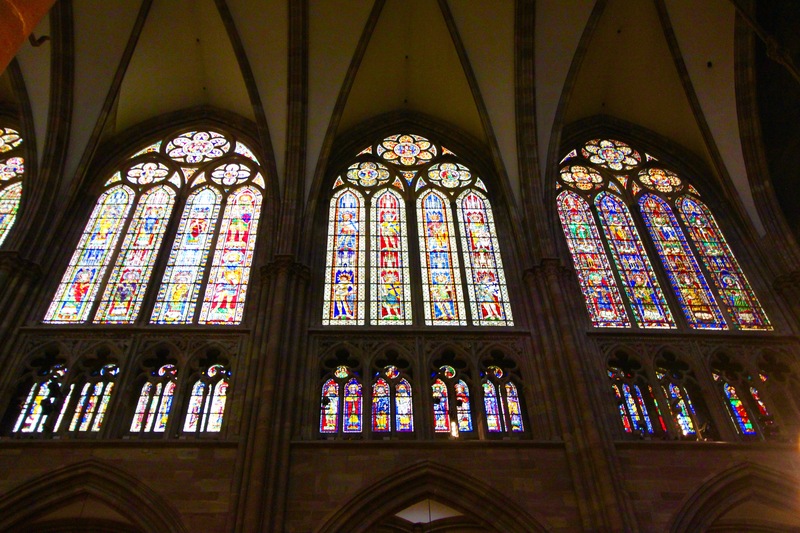 But, as Germany invaded Strasbourg during the beginning of World War II, the Germans had the foresight to remove the original 12th & 14th century stained glass windows for protection. 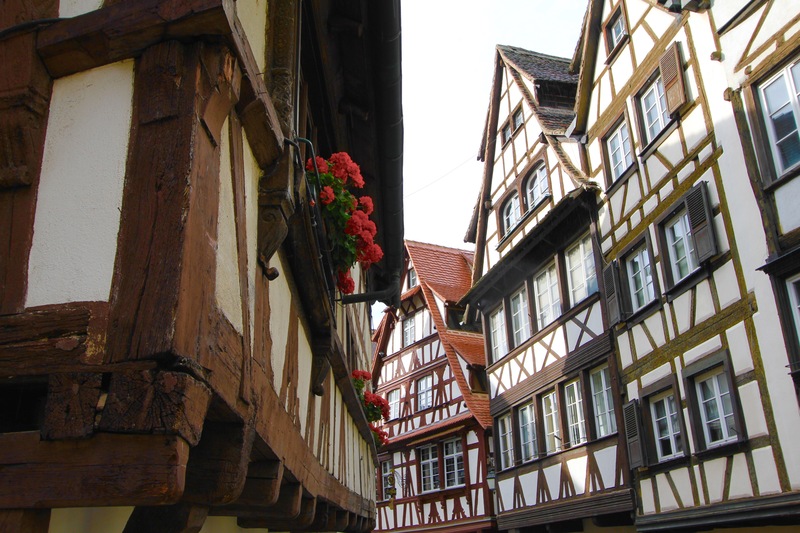 The windows were taken to the German city of Heillbronn for protection deep in the salt mines located there. Thankfully for us today, we can see the actual stained glass windows from the 12th & 14th centuries (the two large construction periods of the cathedral), as British & American bombing raids did damage portions of the church. The outside of the cathedral is very imposing. Cathedrals during the Middle Ages were built high, upward for obvious reasons to be closer to God, as well as a symbol of wealth and power of the Catholic Church. 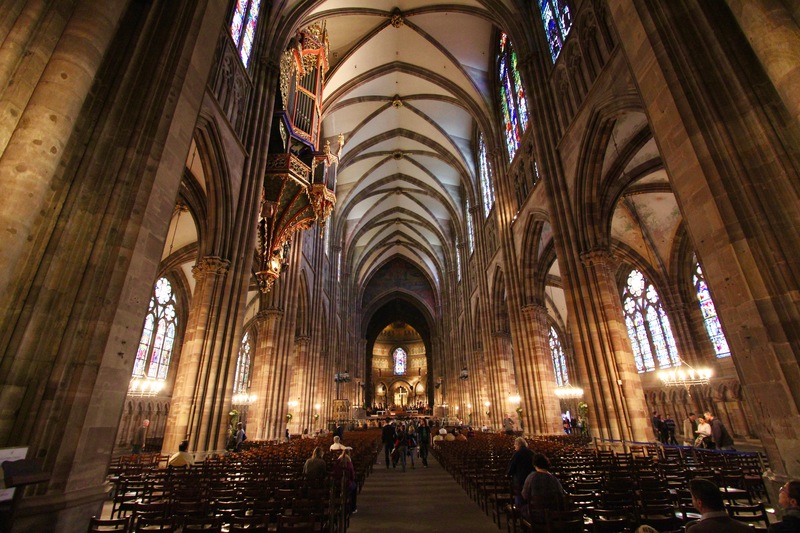 The cathedral in Strasbourg is definitely Gothic architecture at its finest. Just outside of the cathedral is a large square where people congregate in front of the cathedral with the spectacular views upward. 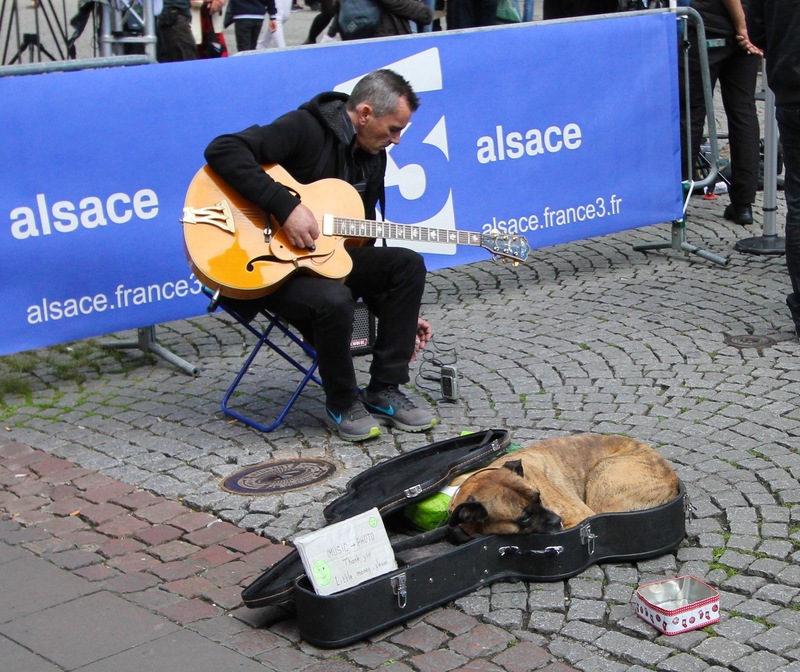 Naturally, where there are people, there are street performers….and this one was so cute with his dog sleeping in his guitar case. 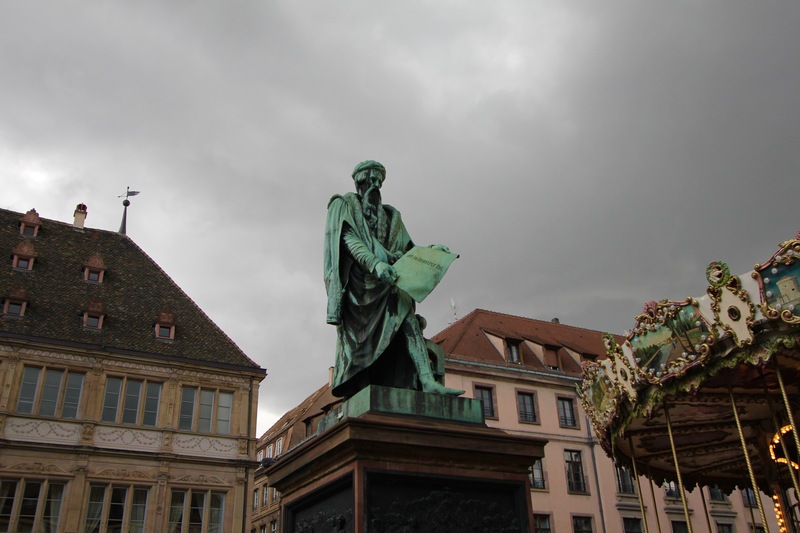 A famous resident of Strasbourg was Johannes Gutenberg, who in 1439 invented the first moveable type printing press (called the Gutenberg Printing Press — I guess originality in invention’s names were lacking back in the day?). Prior to this press, books were made by handwriting the words…therefore, the Gutenberg Press allowed for books to be published faster resulting in more and more books to be available. Obviously, one of the first books to be printed in the new press was a copy of the Bible, which has come to be known as the Gutenberg Bible. 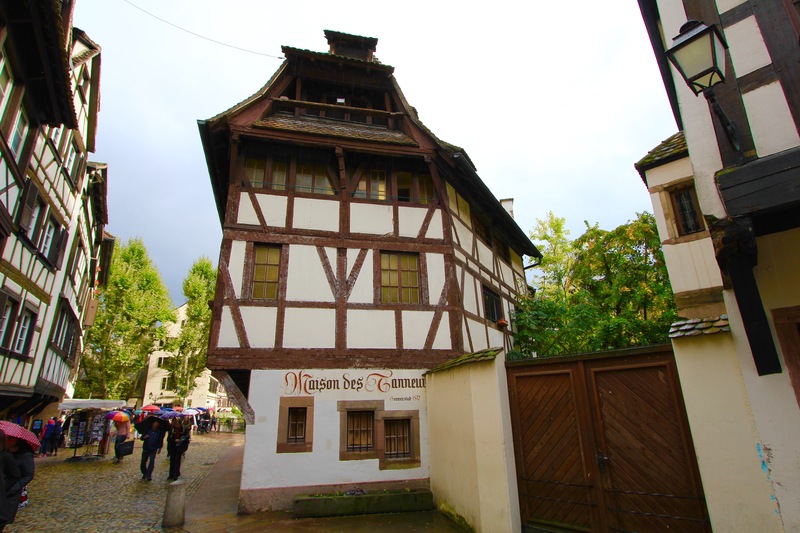 In Strasbourg, you can visit the Gutenberg Museum to learn more about Gutenberg and his invention. 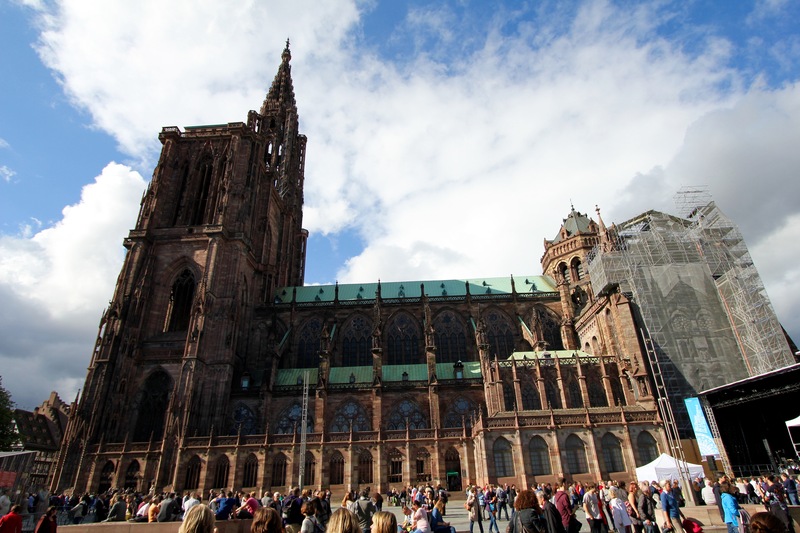 While on the topic of Museums, Strasbourg has many to choose to see. There is the Archaeological Museum, Museum of Modern & Contemporary Art, Museum of Decorative Arts, Museum of Fine Arts, Museum Oeuvre Notre Dame, but probably the best to see is the Alsatian Museum. 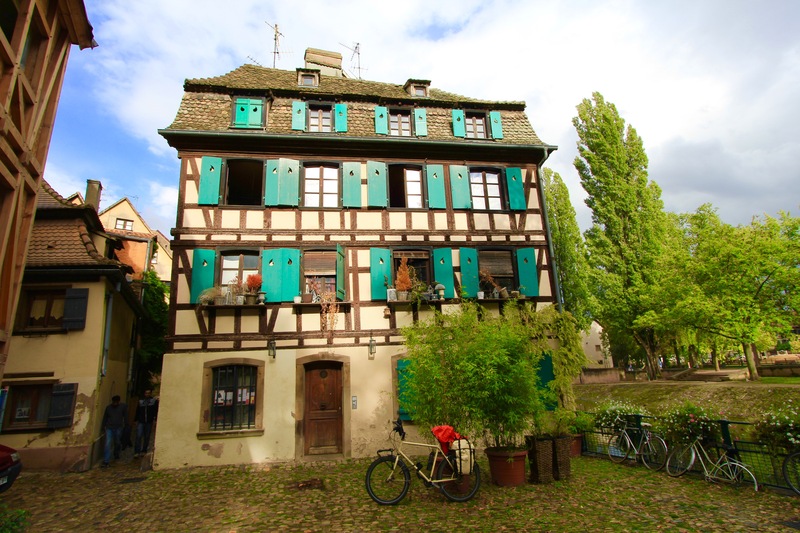 This Museum is one of art and folk tradition of the people who lived and made up the Alsace Region. 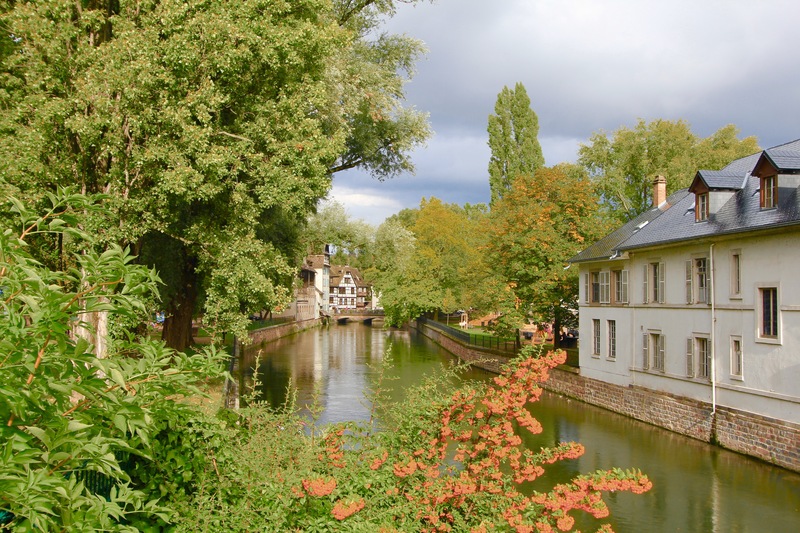 But, for me, the real charm about Strasbourg is the section of the old city center on the Grand Island known as “Petite France”. This section is dominated by the canals that encircle 700 year-old half timber homes. Most of the buildings were built during the Middle Ages and were used as slaughter & tanning houses (i.e., the hides from the animals were tanned various colors). Eventually, the establishments left and became houses. Today, most are used as hotels, restaraunts, store fronts, with some still used as houses. Several of the half-timber buildings have beautiful flower boxes outside the windows, which add just a perfect touch to the surroundings, especially on the day we visited where the weather was on and off rain showers. We took a boat tour around the Grand Island with the tour company Batorama. Boats leave the main dock every 20 minutes, and takes an hour to pass around the canals, while admiring all of the different buildings along the way. We highly recommend this hour long trip around the island on the canals. Passing by the buildings, whether on foot or by canal boat, you do feel like are within scenes from a fairytale. Even though some of the buildings may look crooked, it still stands after 450 years! Notice just above the lower window where it says established in 1572 — crazy! Strasbourg is also home to the European Union Parliment. The EU holds sessions here in Strasbourg as well as in Brussels and Luxembourg. The EU buildings are modern, glass buildings a few miles away and is a stark contrast to these buildings for sure. With the passing rain showers, the sun would come out resulting in the various colors of leaves and flowers to stand out against the grey ominous clouds. The only boat traffic are the canal tour boats and the occasional kayak, which makes for an extremely peaceful view or stroll along the canals. Even if the building doesn’t have flower boxes, the painted shutters add that extra color to the half-timber buildings. After spending about 4 hours in Strasbourg, we made our 2 hour return drive back home to Germany. 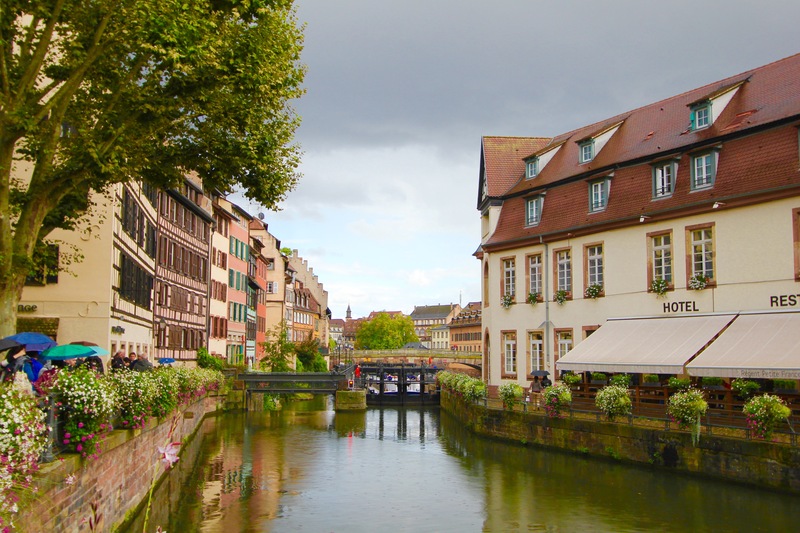 Strasbourg is a definite must-see city for anyone spending time in this part of Germany or France. 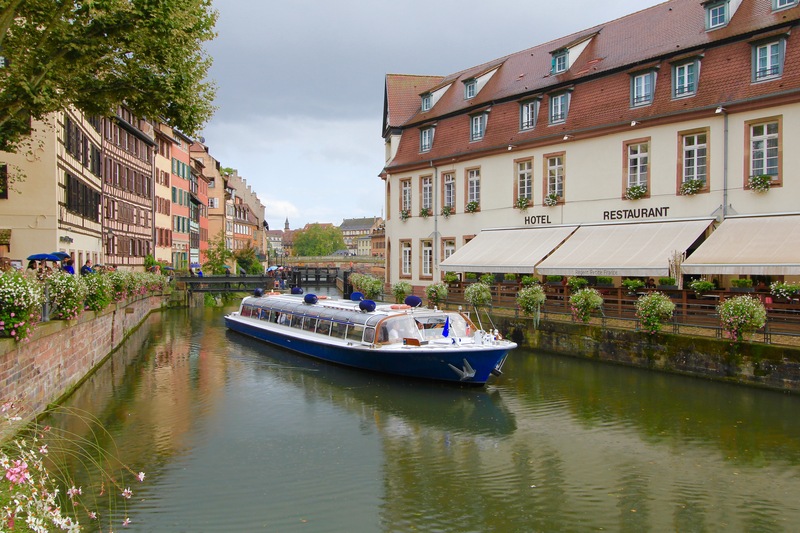 While traveling to Strasbourg as a day trip from Paris by train in 3 hours is okay, but if this is your plan then do stay the night in one of the hotels along the canal before returning back. 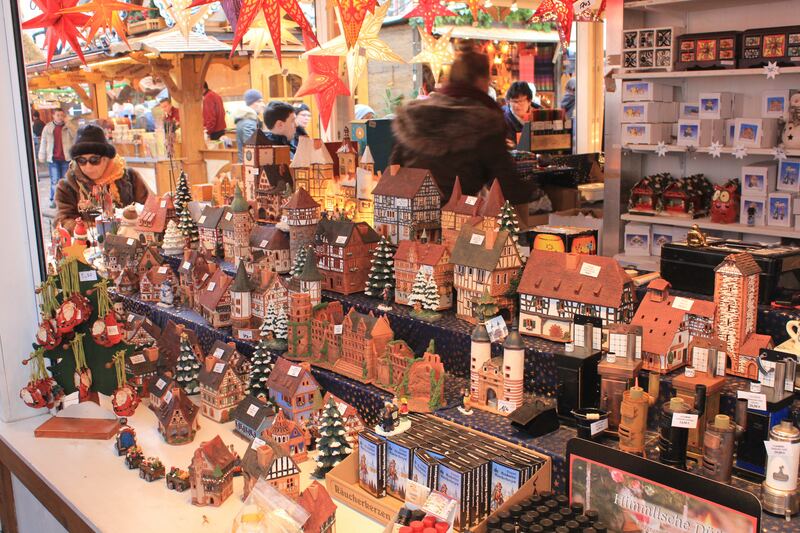 One last comment about Strasbourg is that the city is famous today as holding one of the largest Christmas Markets in Europe from late November to late December that started back in 1570! This is definitely a visit will return this winter to see firsthand!